My observances are my own. The primary tenet of my practice is the acquisition of knowledge and information--penultimate to this--is the dissemination of information. However, I have found many are of a sensitive disposition and the nature of my accrued knowledge is often viewed as aberrant. As such, I ignore my secondary tenet as a courtesy to those delicate souls. My own accumulated knowledge will be shared at my discretion and leisure to those that have a genuine desire for it. 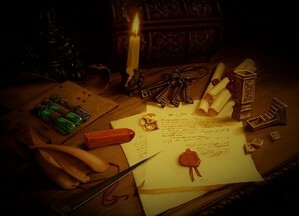 I am not inclined to give any consultations by means of divination except in exceptionally rare instances. The spheres previously listed, and the relevant knowledge therein, have been the result of a cumulative fifteen (15) years of research, and exploratory experimentation both real and speculative. If you wish to discuss an exchange of concepts and learning, I am open to the discourse. Providing that my opposite can conduct themselves in an amiable, civilized manner. I shall expand upon this information as progress and time dictate, not before. Do as you shall, as shall I. Good health and fortune be upon you, and yours.